Im Anschluss finden Sie eine Auswahl der von uns veröffentlichten Fachartikel. 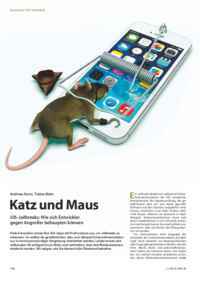 Abstract: Recently, Apple removed access to various device hardware identifiers that were frequently misused by iOS third-party apps to track users. 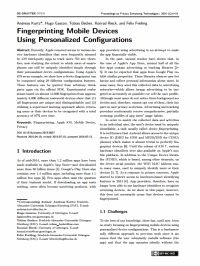 We are, therefore, now studying the extent to which users of smartphones can still be uniquely identified simply through their personalized device configurations. Using Apple’s iOS as an example, we show how a device fingerprint can be computed using 29 different configuration features. These features can be queried from arbitrary thirdparty apps via the official SDK. Experimental evaluations based on almost 13,000 fingerprints from approximately 8,000 different real-world devices show that (1) all fingerprints are unique and distinguishable; and (2) utilizing a supervised learning approach allows returning users or their devices to be recognized with a total accuracy of 97% over time. 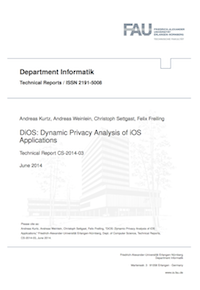 We present DiOS, a practical system to perform automated dynamic privacy analysis of iOS apps. DiOS provides a highly scalable and fully automated solution to schedule apps from the official Apple App Store for privacy analysis to iOS devices. While apps are automatically executed, user interaction is simulated using random and smart execution strategies, and sensitive API calls as well as network connections are tracked. 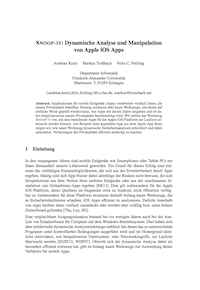 We evaluated the system on 1,136 of the most popular free apps from the iOS App Store and found out that almost 20% of all investigated apps are tracking users‘ locations on every app start, one third of all accesses to users‘ address books are attributed to apps from the social network category and almost half of all apps are tracking users‘ app usage behavior by incorporating tracking and advertising libraries. Passwords have to be secure and usable at the same time, a trade-off that is long known. There are many approaches to avoid this trade-off, e.g., to advice users on generating strong passwords and to reject user passwords that are weak. The same usability/security trade-off arises in scenarios where passwords are generated by machines but exchanged by humans, as is the case in pre-shared key (PSK) authentication. 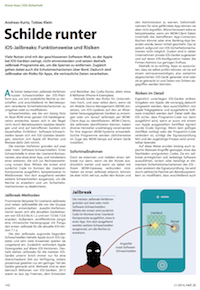 We investigate this trade-off by analyzing the PSK authentication method used by Apple iOS to set up a secure WPA2 connection when using an iPhone as a Wi-Fi mobile hotspot. We show that Apple iOS generates weak default passwords which makes the mobile hotspot feature of Apple iOS susceptible to brute force attacks on the WPA2 handshake. More precisely, we observed that the generation of default passwords is based on a word list, of which only 1.842 entries are taken into consideration. In addition, the process of selecting words from that word list is not random at all, resulting in a skewed frequency distribution and the possibility to compromise a hotspot connection in less than 50 seconds. 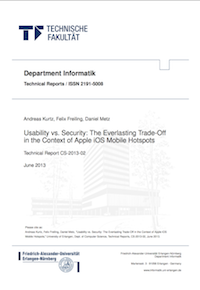 Spot tests show that other mobile platforms are also affected by similar problems. We conclude that more care should be taken to create secure passwords even in PSK scenarios. 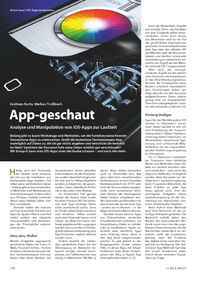 Im Rahmen dieses Artikels werden neben der Beschreibung der wichtigsten Exploit-Mitigation-Technologien unter Linux und der Vorstellung eines Werkzeugs zur Prüfung dieser Schutzmechanismen, gängige Linux-Distributionen hinsichtlich der Verwendung von Exploit-Mitigation-Technologien untersucht. Einführung in die Problematik sogenannter Speicherfehler. 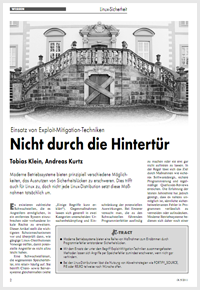 Beschreibung der wichtigsten Exploit-Mitigation-Technologien unter Linux. Vorstellung eines Werkzeugs zur Prüfung dieser Schutzmechanismen. Vergleich gängiger Linux-Distributionen hinsichtlich der Verwendung von Exploit-Mitigation-Technologien.